The states I covered were: Arizona, California, Connecticut, Florida, Idaho, Illinois, Maryland, Massachusetts, Michigan, Mississippi, Missouri, New Hampshire, New York, North Carolina, Pennsylvania, South Carolina, Tennessee, Texas, Virginia, Washington. I also read a couple books that took place in Washington DC. The countries I covered were: Canada, Russia, Africa, China, Egypt, Albania, England, Denmark, Zimbabwe, Scotland, Wales and Germany. 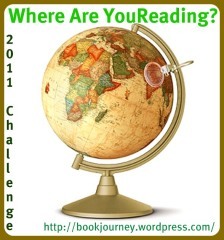 Although I didn't manage to read from every state, I think I'm going to join this challenge again in 2012. It was fun to keep track! I enjoyed this, too, last year. I also read books from 20 states and I think about 10 countries - I posted my summary last week, too. One of the great things about reading - we get to travel the world!